Gudgeon Pins/Piston Pins for single cylinder engine applications are made from 15MnCr3 grade steel alloy. All automobile Gudgeon Pins are manufactured from 20MnCr5 grade steel alloy having hardness between 55 to 65 HRC. Owing to our in-depth industry experience and precise knowledge in this domain, we are offering an outstanding assortment of Gudgeon Pin. We are engaged in offering Air Conditioner Guzin Pin for our clients. 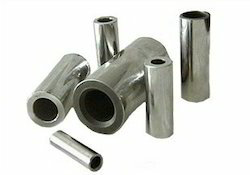 We are able to manufacture a durable range of piston pins that is constructed using high grade alloy steel. To withstand wear and tear, these pins are duly hardened and their surface is properly grounded and polished. In addition to these pins, we are also engaged in offering gudgeon pins and crank pins. Offering gudgeon pins, pistons with high quality graded alloy steel.